The sign in the window tells the story. It’s not something that Harley-Davidson dealers have experienced since the 1980’s, but it’s starting to happen across the U.S. – foreclosure and going out of business sales. Today it was announced that in Dubuque, Iowa, Wilwert’s Harley-Davidson is being foreclosed after almost 50 years in business. According KCRG news and the county Sheriff’s department the building is set for public auction on January 15, 2009. The sale notice states there is a judgment awarded to American Trust and Savings Bank in Dubuque for $1.6M. Things like this can really have a “domino effect” and in the end affects a lot of people beyond just the immediate employees. There is a local HOG Chapter without a sponsoring dealer and more important many people from the dealer as well as the owners have contributed greatly to local charities and fundraisers. It’s a sobering reality and I hope the best for the employees and owners. Interestingly is that the only comment from corporate Harley-Davidson is a “no comment” on these things. Is that corporate lethargy and money talking? In this environment addressing customer concerns and making sure they don’t become further disappointed by parts and service issues should be important…. UPDATE: To clarify, Todd Wilwerts Golf Vehicles is NOT affiliated with the Harley dealer or is it closing. 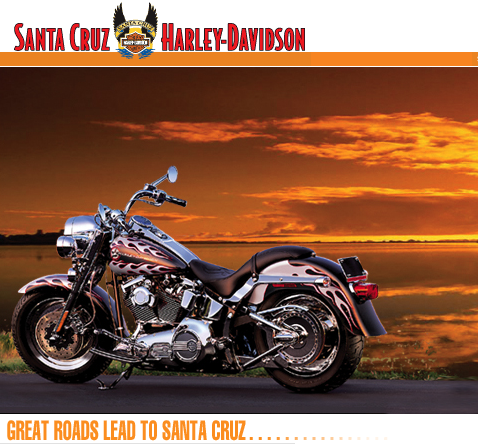 Photo courtesy of Santa Cruz HD web site. The Wilwert’s are wonderful people and to see them go through this is so sad. Individuals who have entered this store in the recent days to relish in this family’s misery make me sick and yet they are the same individuals who will be at the door for a free event sponsored by the Wilwert’s. Try to remember how this will affect everyone, not just the Wilwert’s; the community, non-profit org. that benefit from events sponsored by Wilwert’s, the employees, other business that will be effected. The Gov can bail out the Insurance Companies and Big Corps that have exec’s living in mansions and receiving 7 figure bonuses annually, but what about the hard working family owned business…something to really think about. I’ve heard of their financial troubles over a year ago. I had heard of investors being approached a while ago. You can’t grow bigger than your bills and keep up. It’s unfortunate, but I don’t think it is a surprise. And under the covers – I don’t think the flailing economy can be to blame. You must plan for these rainy days. I think the economy has much to do with this particular situation. When buyers cannot finance due to tighter restrictions on credit; example- a year ago an individual with a low credit score of 640 could walk out the door with a bike plus any and all accessories, today this is not going to happen~hence no profit.